First things first: the rum-soaked sugar cane. It is both visually pleasing and an essential garnish for this cocktail. Caipirinhas are a favorite in my cocktail repertoire, so I am always happy to try a new one, and having one from Calavera’s impressive bar just made sense although tequila is their primary focus. 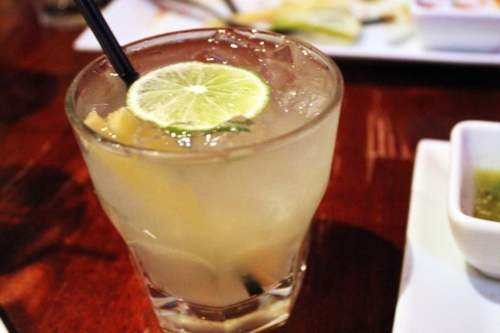 This one is made with Brazilian Clear cachaça, lime juice, and sugar … and that’s it folks. That’s all a cachaça should be. This one is possibly too sweet, which may come from my insistence on sucking every drop of sugar water from that cane that I can. I would almost recommend that Calavera leave out the sugar from the preparation entirely, depending on the cane instead, but I would bet that would be too strong for your average swizzler. Regardless, this was a drink loyal to its origins and delicious.